This simple veal stew makes a hearty weeknight meal. Serve over aromatic basmati rice. 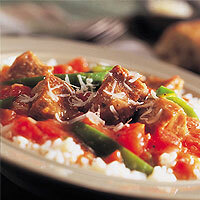 Add bell peppers; continue cooking, covered, 30 minutes or until veal is fork-tender. Serve over hot cooked rice, and sprinkle with grated Parmesan cheese.